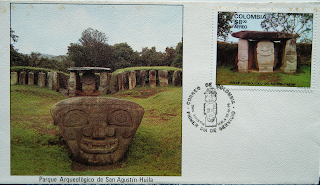 The 1952 definitive on left possibly shows a monolithic statue from the UNESCO San Augustin Archaeological Park. 4 years previously, this same image was on 2 stamps from the 13v airmail definitives in yellow (5 centimes) and green (30 centimes). Same definitive in green. Is this 'A' overprint modeled after the consular ones of the 1920s? If so, 'A' indicates purchase by a German consular agency. 1979 'Grave Sculptures' issue from the same park.